The award-winning home of Frank Herdman and Alice Temple proves that rainwater catchment tanks can add both beauty and functionality to a home’s design. Frank and Alice fell in love years ago with their Casa Solana Santa Fe neighborhood. They bought a fixer-upper Stamm house with poor natural lighting, low ceilings, and a small, broken-up floor plan and turned it into their dream home with natural lighting and a thoroughly contemporary design. The home was recently awarded the grand prize in the Excellence in Remodeling contest sponsored the Santa Fe Homebuilders’ Association. The remodel required updating the electrical and plumbing systems, as well as adding skylights, flooring, natural wood cabinets, a redesigned kitchenand living room as well as a portal to seamlessly expand the indoor space to outdoors. As part of this major renovation, Frank and Alice wanted to add rainwater collection, but instead of hiding it, they decided to make it an integral part of the architectural design. With new galvalume gutters and downspouts installed as part of the remodel, a galvanized tank was a perfect complement to the design. The tank was installed to be visible from the street and the yard. This great looking, yet simple solution harvests rainwater off the house for plants nearby. It’s a passive system with no pumps or moving parts; consequently, it’s maintenance-free. 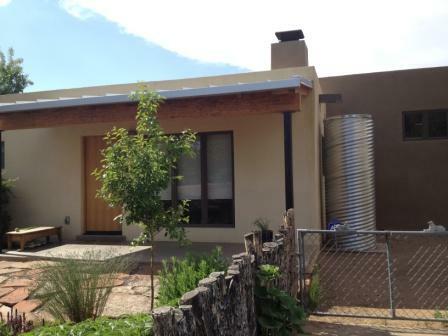 You can find many attractive metal tanks installed around Santa Fe. These include the painted one at the Santa Fe Children’s Museum, metal tanks outside Lowe’s and the southern Sunflower Market and the one installed at Goodwater Company. Frank and Alice’s cistern is three feet in diameter and 8 feet tall, and capable of holding more than 400 gallons of water. In the winter, a drain valve can be left open so that water drains out of the tank and doesn’t cause freezing problems. The tank’s galvanized lid matches the rest of the system. All the major components are installed inside the tanks so nothing shows but the outlet. 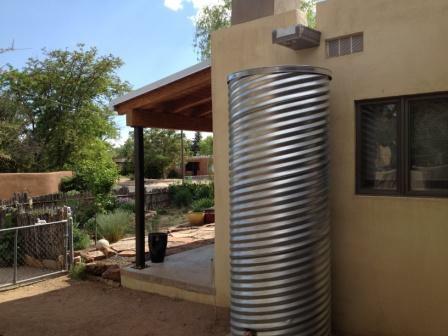 “The metal cistern is a perfect match for the new contemporary look of the house,” says Frank. “And we now get easy access to more water than we used to capture in two small rain barrels that overflowed and created either a muddy mess in the summer or an ice rink in the winter.” The owners get lots of compliments on the system. All in all, the cistern is a perfect combination of water conservation and aesthetic enhancement for the home. The resulting system was quick to install, relatively inexpensive (i.e., more expensive than a plastic tank, but much less expensive than a custom tank), maintenance free, and will provide many years of free rainwater to be used on the property’s natural landscape. It saves municipal potable water and the energy associated with producing and delivering that water. The owners agree that it makes a beautiful addition to their home’s design and keeps their gardens happy while being kind to the environment. Related Product - What Tank Type is Best for Me?